It’s Halloween, a day when costumes conjure playfulness among children and adults alike. To celebrate, I’m reprinting below my post from October 31, 2010, available in the IntLawGrrls archives here. The donation link at bottom still works, so consider a contribution on behalf of the world’s children. Often completing this ‘Grrl’s Halloween costume was the tote at left. Many a year we Midwestern children would knock on doors to “Trick or Treat for UNICEF,” seeking donations to help the United Nations help children in need. For many of us, it was an early raising of awareness — an early invitation to consider how we might respond in our own small ways to the plight of others throughout the world. Of great interest, therefore, was the news that the woman who founded the campaign has died at age 93, just a few days short of the 60th anniversary of her achievement. As detailed in The New York Times‘ obituary, the idea came to Mary Emma Allison, a schoolteacher long concerned about social justice, while shopping in 1949 in Philadelphia. 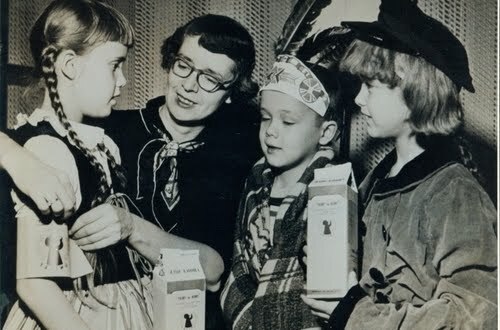 (credit for photo of Allison and her costume-clad children) Soon she and her husband had created a global movement, called “Pennies for UNICEF” in those days of less deflated economy. Enlisted in the effort have been cultural icons ranging from Casper, the Friendly Ghost (below), to Superman, the Man of Steel. Since its founding the campaign has raised more than $160 million. 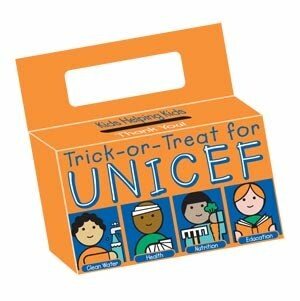 No need for a collection box to contribute in Allison’s honor; anyone can click here to donate to UNICEF this Halloween.